Top O’ The Mornin’ To Ya… Happy St. Patrick’s Day! Irish Cream Sourdough Cake is super sensational. This cake has it all; chocolate, sourdough starter, Irish cream liqueur, cream cheese, Irish cream liqueur glaze and frosting. Hmm, oh yeah and a drizzle of chocolate syrup. All of the steps made to make this delicious cake, turn it into a true experience. Layers upon layers of delicious flavors. This recipe has several steps but this cake is so worth it. It’s so good! The “cake” part of this recipe has a fed sourdough starter, cocoa powder, cold coffee and Irish cream liqueur. Then there is the cream cheese filling made with sugar, an egg, cream cheese and a little bit more Irish cream liqueur. The next step, pour half of the cake batter into a greased and floured Bundt pan. Top the batter with the cream cheese filling. Spoon the remaining batter over the cream cheese filling and carefully spread the batter over the cake. Bake and cool cake completely. After the cake is cooled completely, a glaze is made of confectioners sugar and additional Irish cream liqueur. This mixture is drizzled over the cooled cake and allowed to “setup” which basically means to allow the glaze to harden. After the glaze becomes firm, it’s time to make the frosting! The last and final step is to make the cream cheese frosting. Cream cheese, confectioners sugar and Irish cream liqueur are creamed together and spread thickly on the cake. 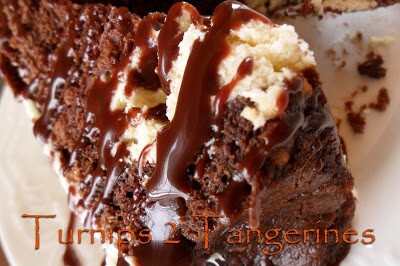 Right before serving, chocolate syrup is drizzled over the cake. Cut thick slices and serve. A delicious Irish cream cake made with a sourdough starter, and chocolate. 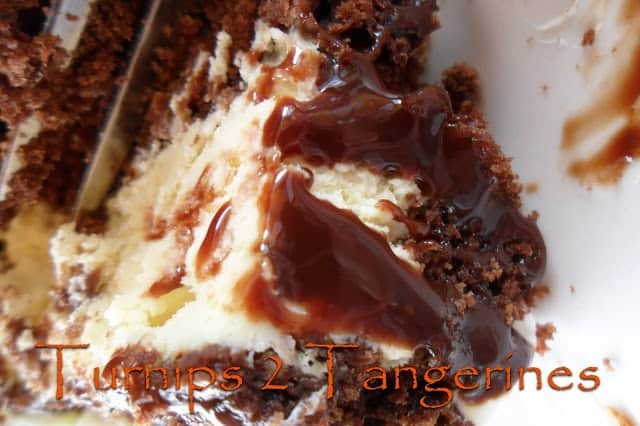 This cake also has a cream cheese filling, Irish cream glaze, Irish cream frosting and then drizzled with your favorite brand of chocolate syrup. In a large bowl, stir together the fed starter, milk and flour, it will be fairly thick. Cover the bowl with plastic wrap and let sit at room temperature for 2 to 3 hours. The mixture will expand slightly. 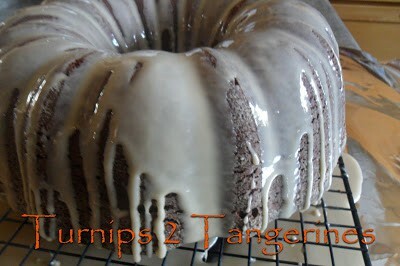 Preheat oven to 350º Grease and flour 12-cup Bundt pan, set aside. In a bowl of a stand mixer, fitted with the paddle attachment, combine the sugar, oil, vanilla extract, salt, baking soda, and cocoa powder. Beat on low speed to combine, the batter will be grainy. Add the eggs, one at a time, beating well after each addition. Add the coffee or water and Irish cream liqueur. Beat until combined. Add the starter mixture to the batter and beat on low until incorporated. This may take a few minutes and you may need to scrape the starter mixture off the paddle, (the starter will have a slightly elastic quality that makes it stick to the paddle) continue beating until batter is smooth. Pour 3 cups batter into greased and floured 12-cup Bundt pan. Spoon filling over batter, without touching sides of pan; cover with remaining batter. Bake for 55 to 65 minutes or until toothpick inserted in the center comes out clean.Transfer pan to a wire rack, cool on rack for 15 minutes. Turn cake out, removing cake carefully from pan. Cool completely on wire rack. Combine all filling ingredients in a small bowl. Beat at low speed, scraping bowl often until smooth; set aside. In a small bowl, combine confectioners' sugar and 3 tablespoons Irish Cream Liqueur. Whisk until smooth. Drizzle over cooled cake. Beat cream cheese until light and fluffy. Add confectioners sugar and Irish cream liqueur; beat until smooth. Spread over cooled cake. Drizzle with your favorite Chocolate Syrup. Thanks Joanne~ That about sums it up!! Wish I could try now! Oh my, this sounds and looks fantastic! Thanks for sharing on Foodie Friends Friday! Good Morning Lynn, I do not know how I missed this fabulous chocolate cake, but I found it when you posted it on Carole's Food on Friday. It sounds fabulous. I have never made a sour dough starter, so I am going to see if you have posted how to make it. One of my daughters does not like Christmas cake, but loves Chocolate cake, and I know she will really love your cake. This cake must be amazing! Hope you are having a great weekend and thank you so much for sharing with Full Plate Thursday. I am in love with this cake! Like I want to stuff the whole thing in my mouth!!! Thank you for sharing this YUMMY cake at Tuesday's Trivia Party! It was David's pick of the Week. It will be featured tomorrow on my follow up. See you next week. Have a great weekend. Whoa…this cake is so ridiculous! Awesome job!! 🙂 Thanks for baking with us again this month! Oh. My. Gosh. That. Looks. Amazing. Seriously. I want a slice right now. YUM! Oh boy, I can just imagine how good this cake must taste! Irish Cream in everything, wow! Thank you for entering the Spike! Irish Cream Recipe Challenge & good luck!! Looks delicious! I love Irish Cream in chocolate cakes and cream cheese frosting makes it even better. Holy smokes girrrrl, this is outta-this-world fantastic! 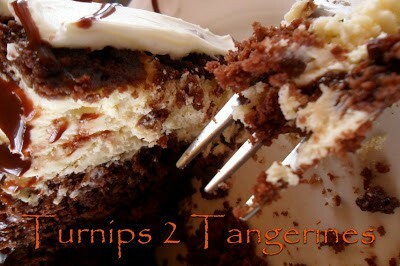 I so want to make this and eat it right now!! Sourdough starter never looked so good! I am seriously in need of a piece of this cake! It has all of my favorites in it. I need to go and read about the sourdough starter! I think I will be dreaming about this! Oh God that's what I'm talking about. Food! Glorious food! This cake looks delicious, Lynn! Thanks so much for sharing and participating in the Spiked! Challenge! Oh my gosh, Lynn. This is so over the top delicious. Love it! Thanks for linking this week! Lynn, I need some of this to drink, oh eat! This is a beautiful cake and I must make it soon! Great recipe for St. Patty's Day or any day! oh Lord that looks so good! Truly it is not even 9 am and I am drooling over this cake you have made, Lynn. Yum !